New York: Wilder Music, 1970. Plate W112. Score (20 pp.) and part (8 pp.). G, some wear at extremities. Written for and dedicated to James Pellerite. Self imprint, worldcat finds no copies. An unclassifiable American original --Gunther Schuller, Grove Online. 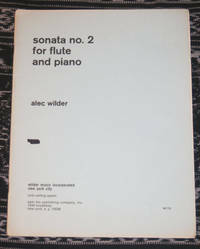 Wilder (1907-1980) was the author of I'll be around, Sea Fugue Mama, and Elegy for the Whale for tuba and orchestra.. Wraps. Good. 4to - over 9¾" - 12" tall. New York: Associated Music Publishers, 1951. Quarto. 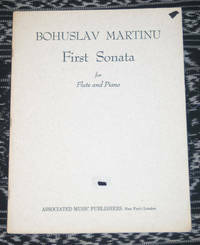 1 score (34 p.) + part (11 p.) Until he was 12, Martinu (1890-1959) lived in the bell tower of a church. The flute sonata was composed for George Laurent, principal flautist of the BSO. Mvts: Allegro, Adagio, Allegro poco moderato.. Wraps. Very Good. 4to - over 9¾" - 12" tall.